The light and airy shades of neutral beige and cream are a hot must have this year. So pair our So Soho Large leather satchel in cream with gold toned jewelry and a beige set of jeans for the perfect casual look to any holiday BBQ. The hot trend of a loud blocked out print is the perfect fashion for spring and summer 2015. Most celebrities are going with shades of black and white with one line of color to bring it all together, but you can choose to have fun with this trend in any color. Pair it with a fantastic bag that draws the eye such as the Ingrid Quilted Medium Leather Bag Burgundy by Bag Inc.
A casual business look for summer can include a pale pink lip and nail with a nice tasteful blazer over the top of a white shirt and some well fitted jeans. Keep your bag simple in a nice brown leather with a little pop of casual black in your wallet when you bring it out to pay. Go for the casual pop of color this year with your Summer look. You can dress up any jeans look by pairing it with a bag that offers a little bit of color. Keep it simple with a top in a neutral shade and you have the perfect look. Do you love a luxurious leather bag? Our Le Jamais Plein sac is made of amazing quality brown faux leather. The bag has a center divider and it is lined with fabric. The hardware is gold, which goes great with the brown leather. There are a lot of compartments inside the bag to help you stay organized. The best thing about the Le Jamais Plein Sac is that it’s only $49! Pair your bag with a plain tee, skinny jeans, heels, and slicked back hairdo. ‘Tis The Season For Silver! With New Year’s Eve just around the corner, all anyone can think about is party outfit ideas and every one of those ideas has a dash of metallics or sequins thrown in. If you’re a millionaire headed to one of the world’s fanciest Watch The Ball Drop parties, be sure to walk in making a scene in a gown similar to the ones pictured above. If not, do the next best thing and grab a silver handbag. Two of our most fave silver bags are the Caroline Double Flap Bag in Silver and the Adele Flap Bag in Silver, both pictured above. Click the links for more details and more pics! It’s no secret that Lady Gaga doesn’t wear anything if it doesn’t stand out. Making that a prerequisite for all her fashion choices, it’s against her rules to step out holding a simple carry-all tote. Hence this handbag inspired by her style which is exclusive to Baginc! 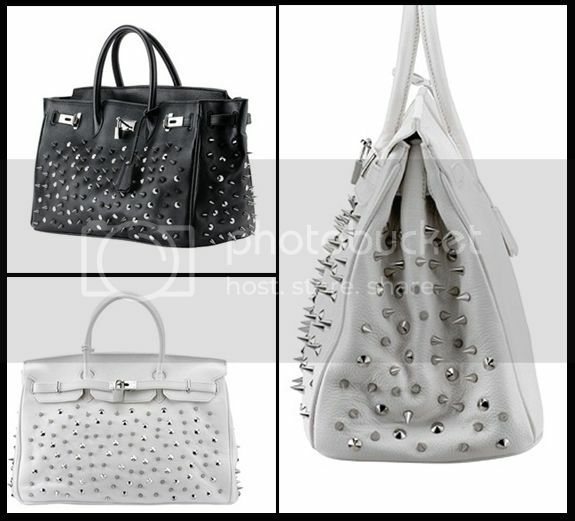 Here are a few pictures of Lady Gaga’s most beloved studded accessories where served as inspiration for this fabulous, rockstar-worthy handbag. You don’t have to be a pop fan to appreciate that this bag is made of luxurious cowhide leather and sports silver toned hardware. The dual carrying handles make it looke regal on the forearm. The flat bottom with protective studs prevents it from getting damaged when set down, as all luxury bags should. Multifunctional slip pockets on the inside as well as outside make it functional as well as glamorous.